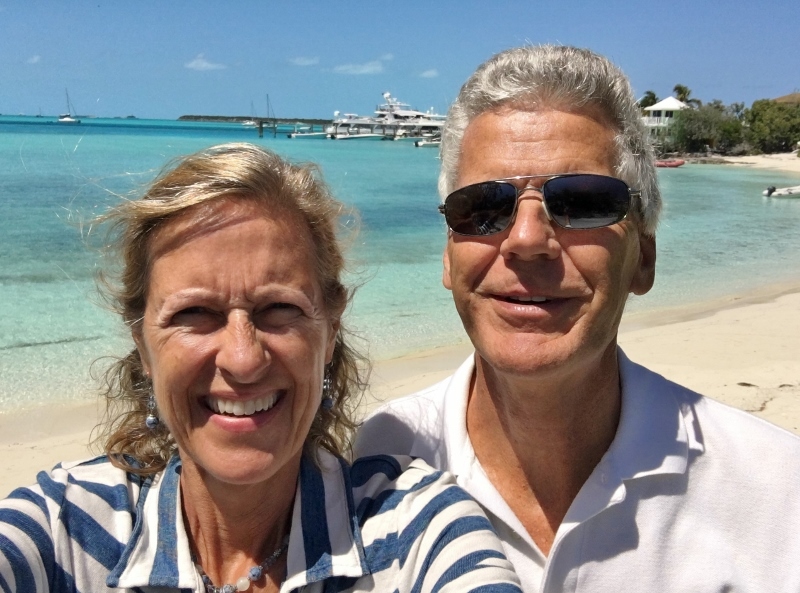 Yes, folks, there is life after George Town, Exumas! Our biggest trouble, however; was with the iPhone (mine) we were using as our Bahamas phone. The battery began to swell which pushed on the case, the button freaked out and the phone screen turned blue. Yikes, this isn’t good. We Googled it and sure enough, it’s not uncommon. We sprang into action. Russ’s iPhone 6 had to be paid off before we could request the unlock code 24 hours later. 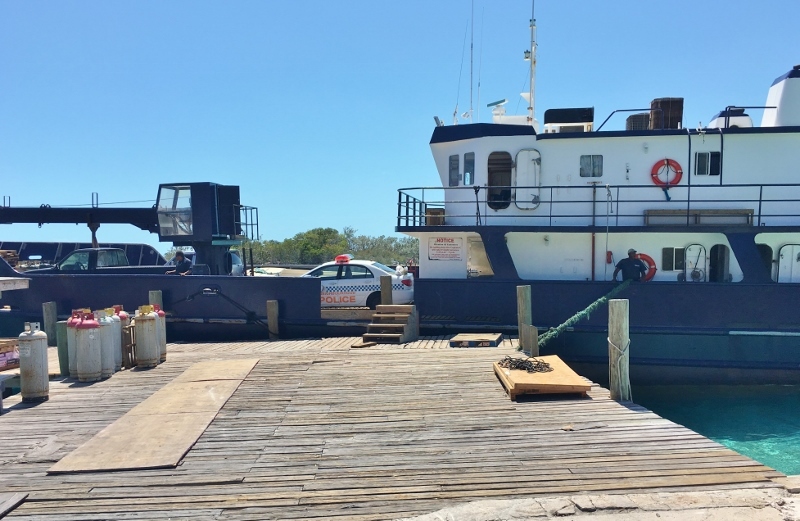 Fortunately this happened in George Town where the BTC cell service is strong and Russ was able to pay off his phone, get the unlock code, remove the Sim card, replace it with the BTC sim card that had been in my phone and we were back in business. With one phone to do it all, we had to be careful not to mess up the anchor drag alarm, so the phone often had to stay behind, thus fewer photos. How did we all (those of a certain age) get by without a cell phone? More than 25 years ago we had our first installed car phones (Russ got them for his locksmith biz so I got one too) and look where we are today! Ok, enough of that, but I want you to know it’s not all pristine beaches and happy times with friends in scenic anchorages in the Bahamas. When things go awry here you’d better be able and equipped to deal with it yourself; unless it’s really bad- but we won’t go there. First stop: Black Cay 18nm north of George Town. Lesli on PDQ Soulstice tipped me off that sea glass could be found here. Right she was! Not to mention a plethora of pretty sea fans on the ocean facing beach and a zillion sunrise tellins on the banks side-facing beach. 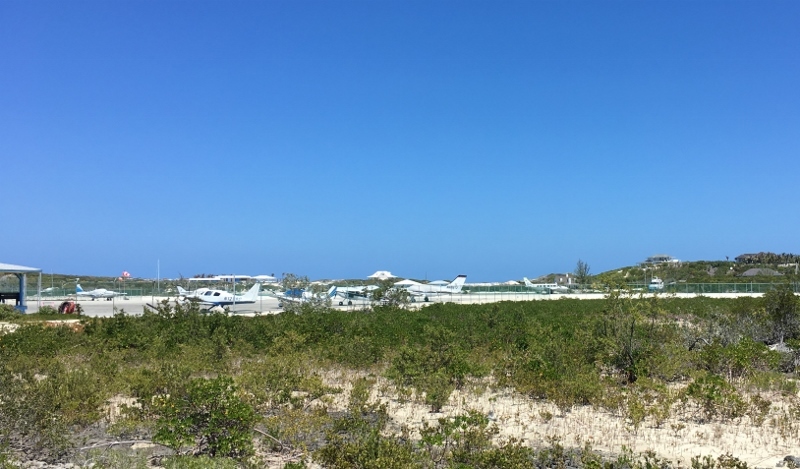 Someone was building a house on Black Cay, but that stopped and you could see they’d made good progress. Maybe it will happen; the beach is lovely and the house has decent elevation. 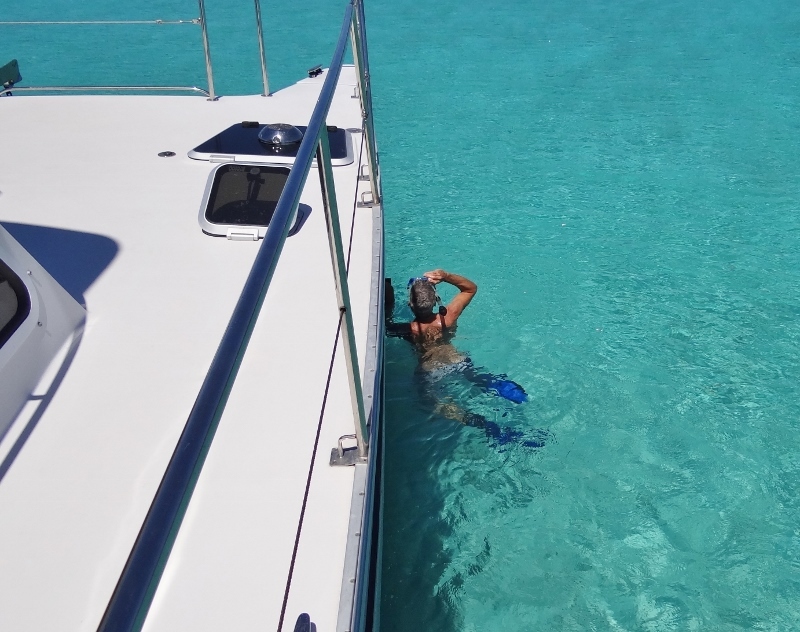 We stopped for two hours- to beach comb and eat lunch before heading back out Glass Cay cut then in at Rat Cay cut. 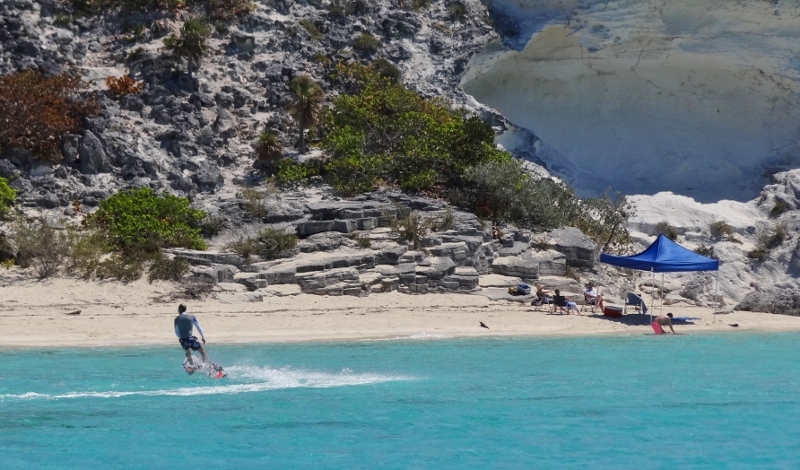 The tour boats are far more numerous than six years ago and we see them all over the Exumas. Good for the Bahamians; maybe not so good for the pigs and iguanas. Rain happens infrequently during winter; you look up, see the dark clouds and there’s your weather report. Pouring rain forced us to make a short stop at Norman’s Pond Cay (not to be confused with Norman’s Cay many miles north) because visibility sucked and we really needed to see. First time we’ve had to do that in Twins. 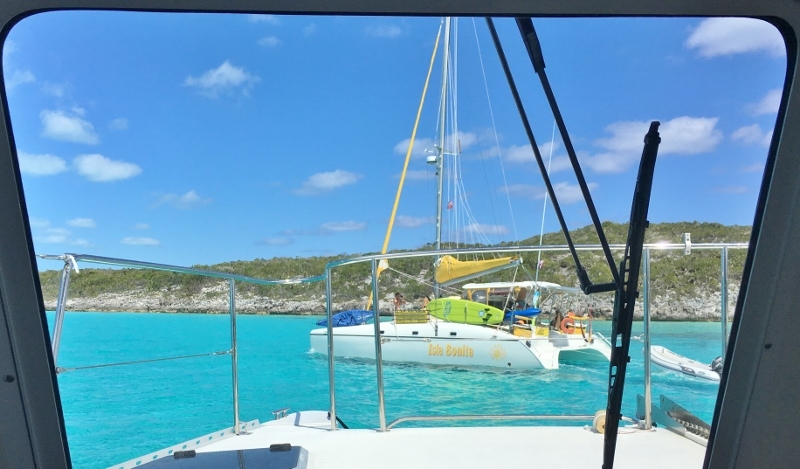 That night we sought shelter from mild West winds behind teeny Gaulin Cay- I mean- look left, look right and that’s all there is. For the next few days we needed to hide from winds out of the NE. Did a short and sloppy trip to Big Farmers, but the winds had yet to shift from NW so our comfort wasn’t exactly stellar until they came from NE. When we anchor at Big Farmers we always watch for goats. 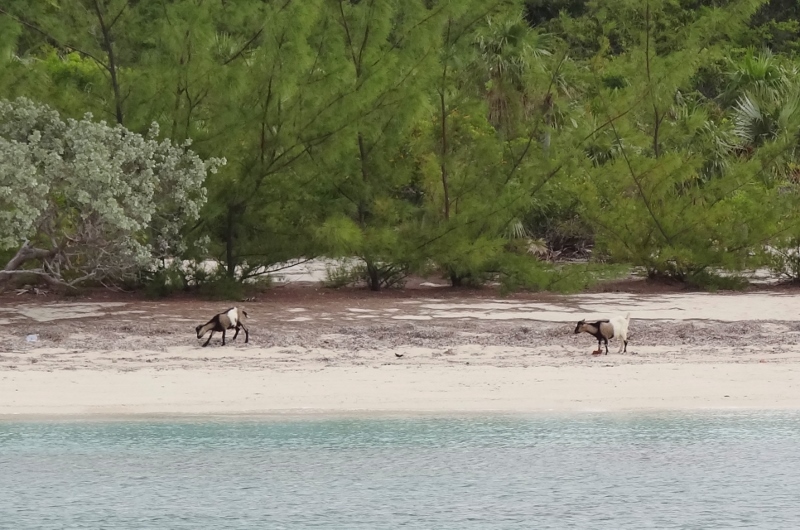 They are elusive, but this time we saw two different families. 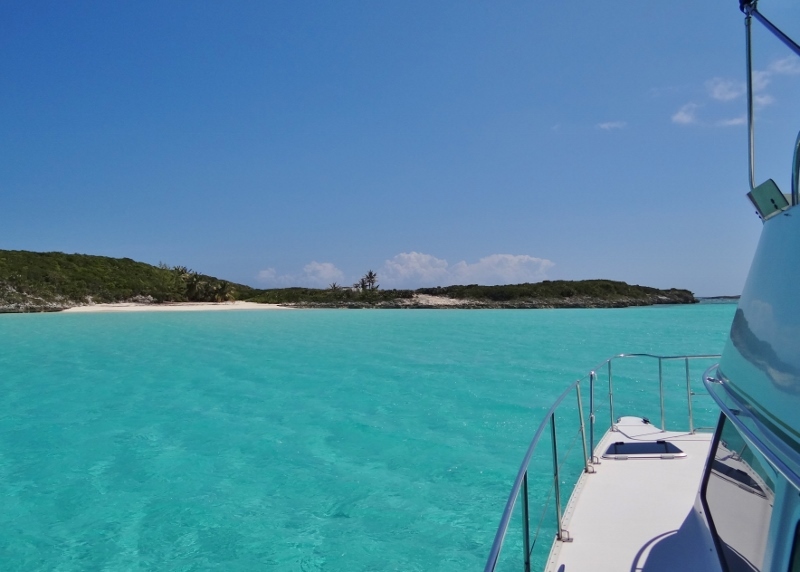 Being on a schedule to have to get somewhere is a no-no, but we’d allowed 7 days to get to Staniel Cay to celebrate Russ’s birthday and the first day of Spring! – minus a surprise visitor, the stop was good but not great. So to make Staniel in time and stop at Black Point for laundry and coconut bread, a stop at Ty’s on Little Farmers didn’t happen. But we did stop at my favorite ocean beach for treasure hunting. Two mega yachts were there anchored too so we got to see their activities, including a sea plane landing and boys with their toys. These motorized Jet Board things are new to our eyes but have been around at least five years. Very zippy and if you can balance you can ride one. 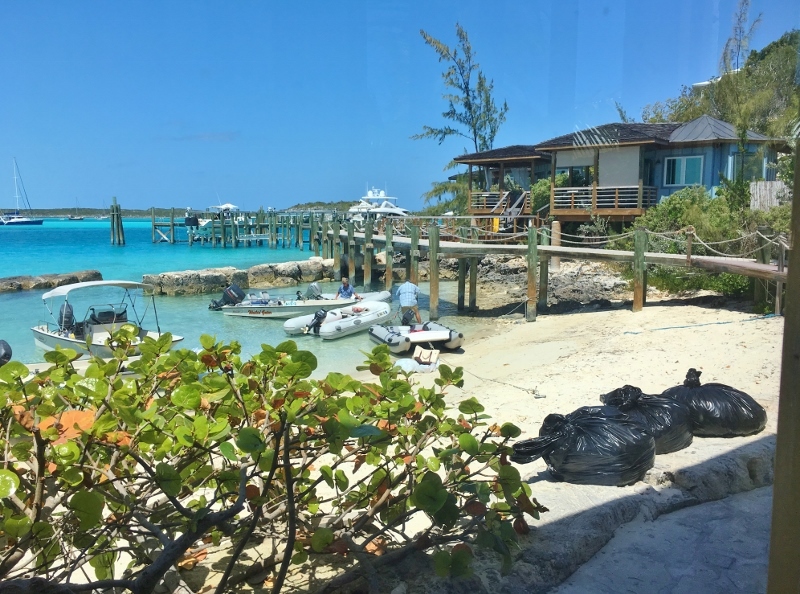 After a stop at one of our favorite almost secluded anchorages on the west side of Pipe Cay, our next stop would be a new one. 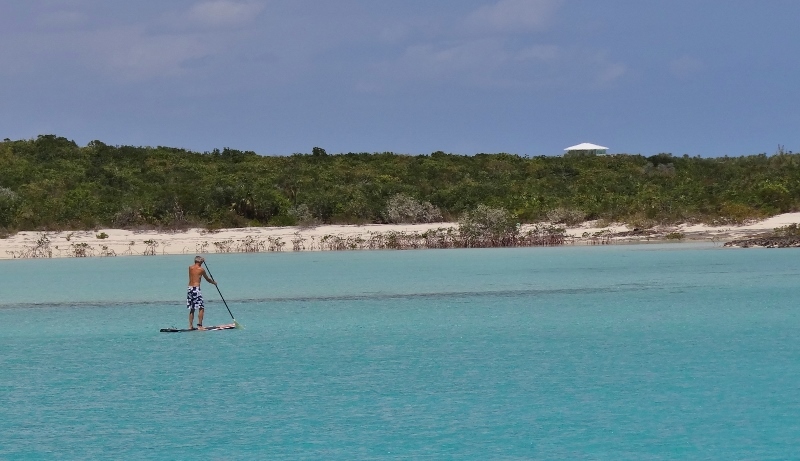 Little Halls Pond Cay (LHPC), owned by… here’s a clue: “The problem is not the problem. It’s your attitude about the problem that’s the problem.” For those who haven’t memorized or recently watched Pirates of the Caribe; that was Cap’n Jack Sparrow, whose alter ego, Johnny Depp owns LHPC. 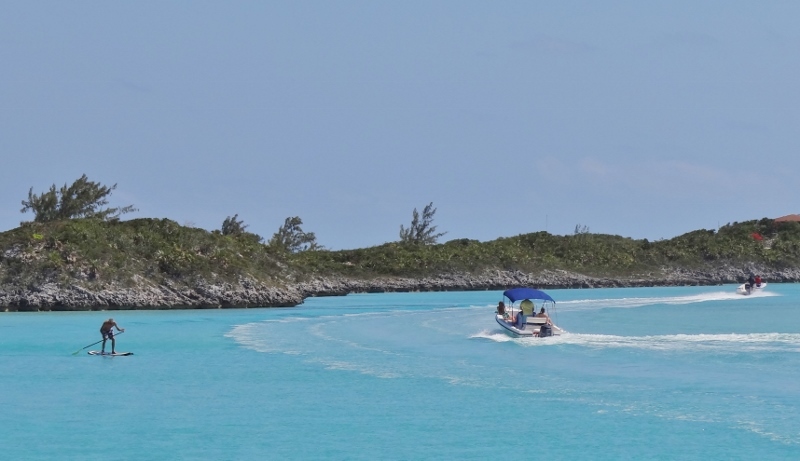 Many of the cays within the Exuma Land and Sea Park boundaries are privately owned. 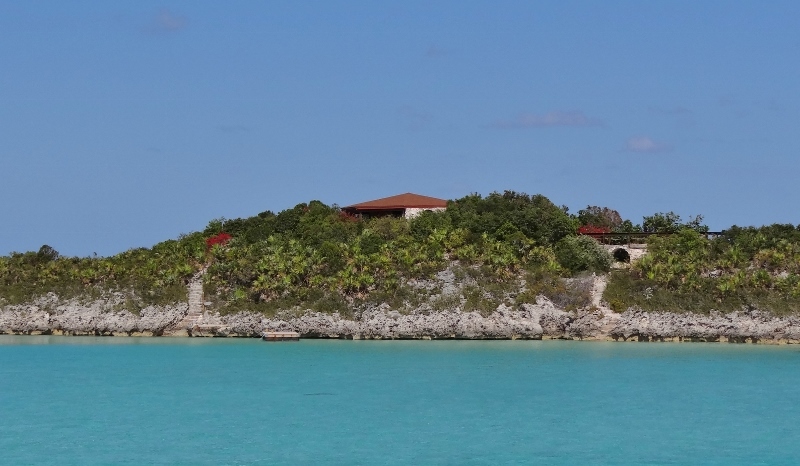 This is one of them, including its extremely close neighbors Ridge Cay and Halls Pond Cay. 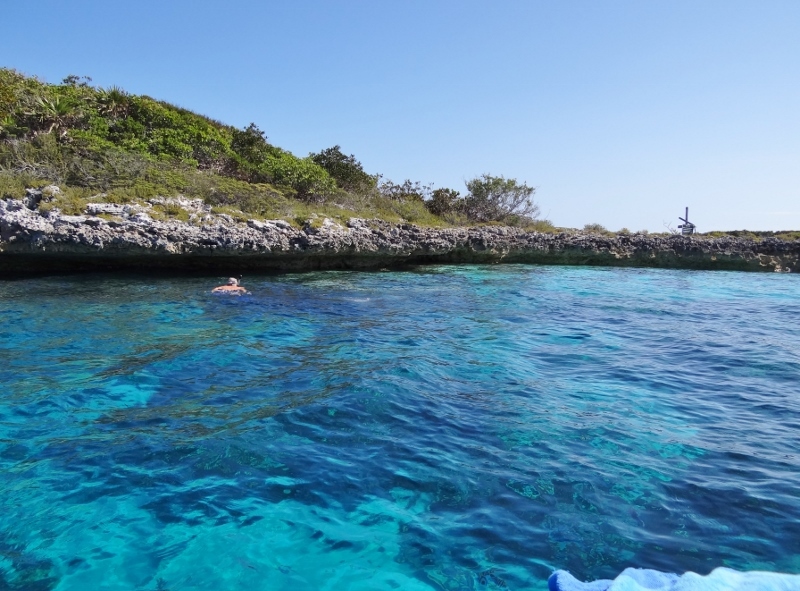 Near the southern tip of the cay is a small but amazing snorkel spot called the Aquarium; the Park provides one big boat mooring nearby, as well as two dinghy moorings right at the Aquarium. 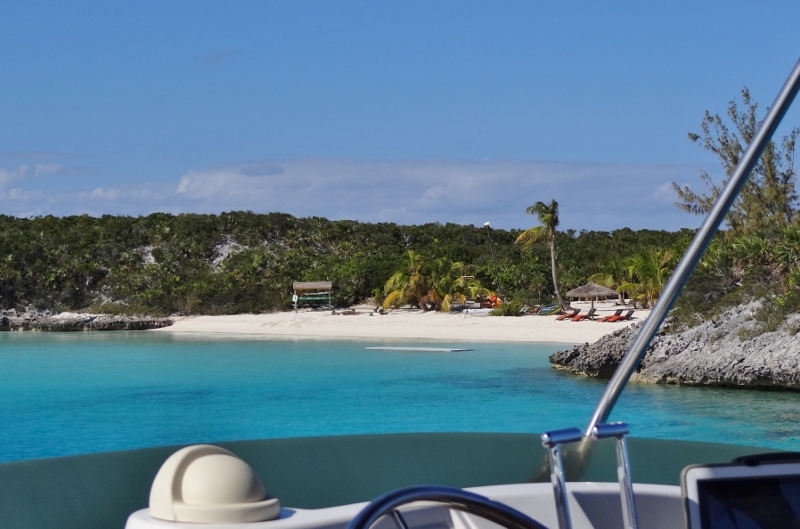 The spot, which is near O’Briens Cay is a bit out of the way but not too far from the mooring field at Cambridge Cay; a very popular mooring/anchoring field in the Park. Very soon, winds would be blowing from the NE>E and we wanted to tuck in at Hawksbill Cay further north up the chain and still in the Park. Decisions and choices. Rarely do we have more than a day or two in a row with very calm “can do anything” conditions. 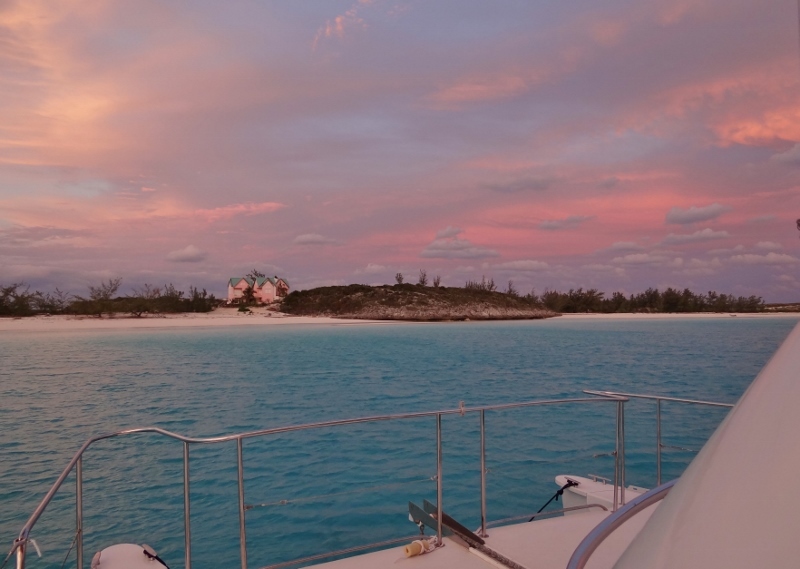 I thought, and even suggested- I want to go on record here- that we might jump out into Exuma Sound to fish for Mahi. Snorkeling won out as Russ hadn’t snorkeled at all this trip. 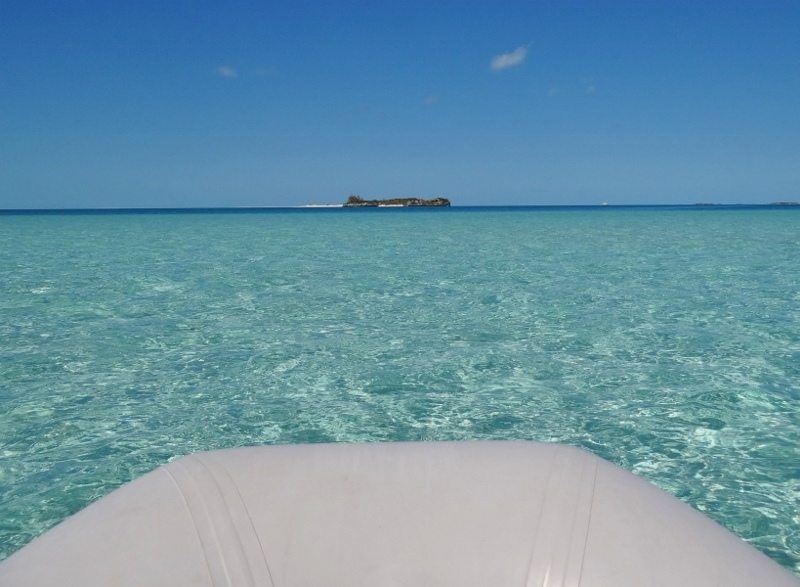 Oh look, a cay named Sandy Cay with lots of sandbars off it. And only 1.5 miles away- dinghy ride! 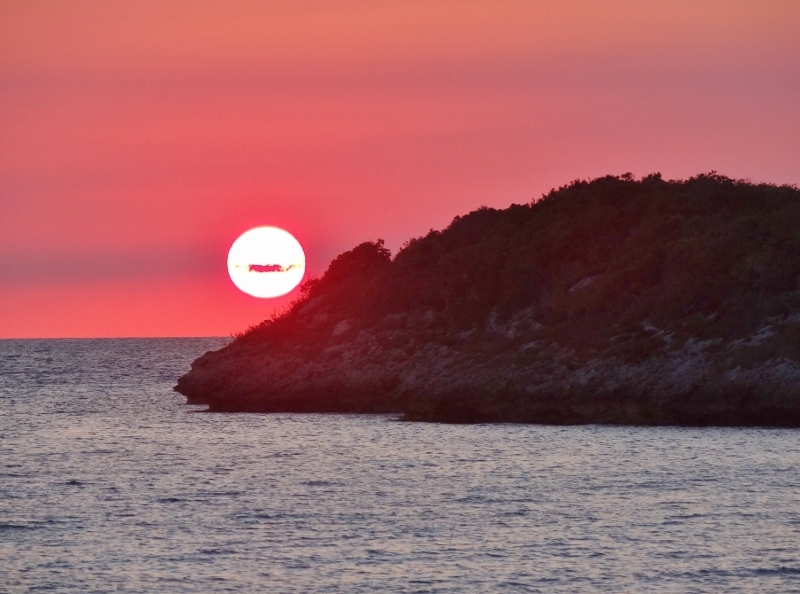 After that it was time for… yes- another paddle in paradise, but first a working swim. Self preservation move. 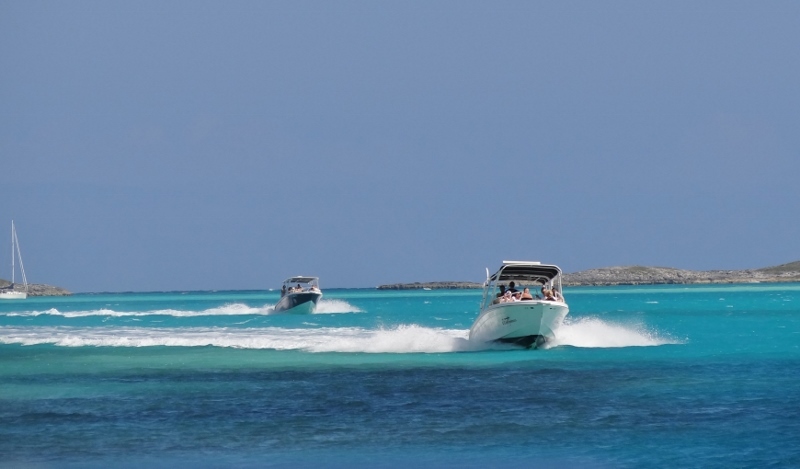 Rental boats and yacht tenders head to snorkel and sightsee.